LA Unified Superintendent Ramon Cortines today for the first time publicly inserted himself into the district’s contract negotiations with the teachers union, calling its latest demands “entirely unrealistic” and asserting that they raise “serious ethical and equity issues” for the district. “Unfortunately, the Superintendent is using scare tactics in response to our efforts to organize in our ‘school blitz’ campaign,” Caputo-Pearl said, adding that Cortines’s message comes as the state is putting more money into public K-through-12 education and the district is still finding money for huge legal settlements and the continuing array of technology problems. The strident tone of the message suggests that Cortines had a wider audience in mind. The union, which has failed to win a raise for teacher for more than seven years, has been threatening a strike for many months. But mindful that any successful strike requires community support, the union has been drumming up for weeks as part of an “escalating actions” campaign. To this point, the district issued no district response, pointing to the disruptive nature of a work stoppage. 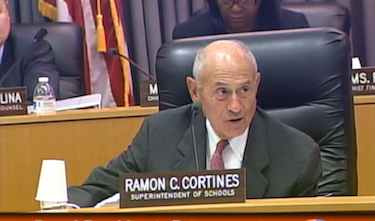 Cortines used his letter to paint a bleak financial picture for the district and its 650,000 students if the district were to satisfy current union demands. “We must live within our means,” he wrote, insisting that meeting the union’s demands would bankrupt LA Unified and lead to the layoffs of thousands of employees, including many of UTLA’s own members. “[T]he sole funding source for UTLA’s persistent demands would be employee layoffs — in catastrophic numbers that would dwarf the impacts of the recent Recession,” he warned. District officials calculate the cost of implementing the union’s latest bargaining proposals over two years would be about $833 million above LA Unified’s current offer despite a drop in UTLA’s salary demands from 10 percent a year. Just last week, the union reduced its salary demand to an 8.5 percent raise, plus additional pay and earnings, as well as class size and staffing reductions that would add another 5,000 UTLA jobs. The district’s latest salary is for a 4 percent raise, plus pay for professional development days that the district says represents another 2 percent. “There are no dollars in the 2014-2015 budget or layoff options to fund any additional increases,” he wrote. Caputo-Pearl took special exception to Cortines’s contention that UTLA’s bargaining position would target workers in other unions for layoffs. The union president took that as an accusation UTLA was being selfish, and “nothing could be further from the truth,” he said. He said UTLA meets with the district’s other labor partners monthly to work on such issues as living wages, immigration and training for teacher assistants. Adds comments from Alex Caputo-Pearl, the UTLA president.